Musculoskeletal burden of disease: do we have any idea? Planning an orthopaedic surgical service is extremely difficult as we are faced with competing demands. Our teaching hospitals are expected to provide a comprehensive training yet the service is dominated by trauma-related patient care. In the past, elective orthopaedic surgery was often ring-fenced in separate hospitals but due to many reasons this has changed. All sub-specialities are competing for resources. Due to political imperatives and the nature of emergency care, trauma and infective pathology dominate the state workload. This creates a self-perpetuating cycle. Initially the emergency work excludes the elective care of the degenerative/congenital and oncological pathologies due to competition for beds and theatre time. There is a change of the staff profile, with those interested and skilled in elective reconstructive procedures drifting into the private sector where they can continue their work. 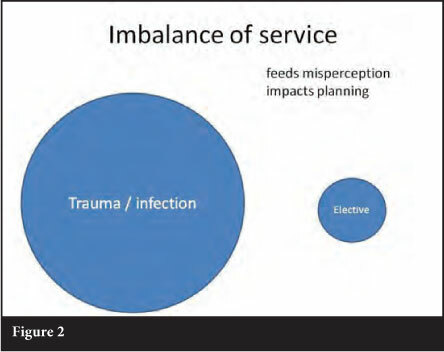 Then, as the managers and doctors only see trauma/infective conditions being serviced, this becomes perceived as the need. The quiet suffering of the functionally impaired arthritis patient is ignored in the face of the emergency work. This cycle feeds the misperception and impacts planning. We thus end up with a much skewed orthopaedic service (Figure 2). The starting point of any service planning is to understand the burden of disease. Once this is achieved, priorities can be set and resources allocated as seen fit. It seems very simple, but finding this data is extremely difficult. Not only is the grouping a problem but so is the use of 'mortality' as an outcome measure. Orthopaedic surgery is of course about life not death, and more specifically quality of life. The WHO web site offers a little more SA data indicating South Africa's relationship to the world's best and worse countries, specifically musculoskeletal diseases and road traffic accidents. Due to this paucity of data we are forced to look at the international literature. Vavken reviewed 14 507 European subjects and calculated the prevalence of spine conditions to be greater than 40% in 35-year-olds and older. Musculoskeletal pathology is classically under-reported as many simply accept their lot, yet it is one of the most commonly encountered pathologies in general practice. As previously stated, death is not a good measure of musculoskeletal pathology. It is equally poor when measuring the impact of orthopaedic surgical intervention. The increasing use of the Disability Adjusted Life Year (DALY) brings our science to the fore. DALY is an incidence-based measure quantifying the health gap between a population's actual health status and a specified norm. It measures both years lost by premature death as well as years lived with a disability, corrected for the severity of that functional impairment. It is thus quite clear that musculoskeletal pathology is highly prevalent at general practitioner level but how does this impact our surgical service? The numbers of elective procedures we currently perform are based on historical theatre allocations, staffing levels and interest, and available finance for consumables/prosthesis. There is little scientific planning behind resource allocation with historically powerful disciplines/personalities dominating theatre access. The total hip replacement is synonymous with orthopaedic surgery. I have used Total Hip replacement (THR) for 1° arthritis to make the point. At Groote Schuur Hospital (GSH) around 90 THRs are done per annum for this indication, but what is the need? The problem is we do not know. There are long waiting lists, and presently this is all one can go on. Waiting lists are unreliable indicators, especially when not actively managed. Lohmander6 looked at the incidence of THR for this specific indication in Scandinavia. Averaging their results for the region, an incidence of 81.5 THRs per 100 000 population can be calculated. Using this incidence in the Western Cape, one can calculate the need based on this incidence. Assuming a population of 4 500 000 and an 80:20 split between state and private practice, one can calculate that 2 924 THRs should be done in the province per annum. This would be shared between the East and West Metropolitan areas, thus and one would expect GSH and its satellite hospitals to perform 1 462 THR for 1° arthritis per annum. Clearly one could argue (correctly) that the Western Cape age demographics differ from that of Scandinavia. However one can repeat the calculation to correct for this. Lohmander's6 average THR incidence for 50 to 89-year-olds is 263/100 000. From the Western Cape census (2007) there appears to be in the region of 580 000 people older than 50 years. Repeating the calculation suggests that GSH (and its two smaller satellite hospitals) should be performing 610 THR for 1° arthritis per annum. This is still seven times more than we are currently doing. In addition this does not take the backlog; other pathologies (inflammatory arthritis/hip fractures); medical tourism from other provinces; and population growth since 2007 into account. With similar assumptions as in the THR exercise, i.e. 4 500 000 Western Cape population, 80:20 state-private split and 50% to be done at GSH, 1 782 knee scopes should be done per annum. This translates to 34 scopes per week, if all 52 weeks allow elective work (which is unlikely). In the United Kingdom audit, 6% of the cases were ligament reconstruction and 35% meniscal surgery. This would translate to 12 meniscal surgery cases and two ligament reconstruction cases a week at GSH. At present GSH has only one morning soft tissue knee list a week. Unfortunately other common orthopaedic procedure incident rates were not found in the literature. However it is quite clear that there is a high burden of musculoskeletal disease in the community. One would thus expect a great need for reconstructive orthopaedic surgery. 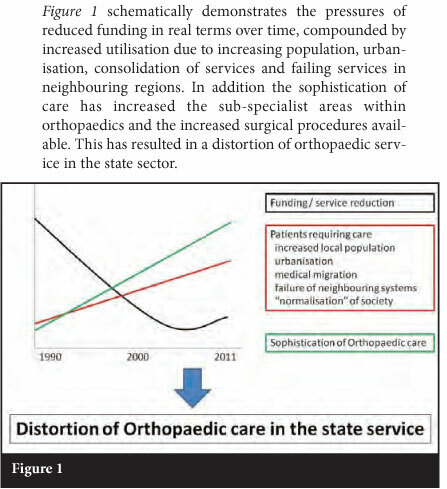 By looking at two commonly practised orthopaedic procedures (THR and knee arthroscopy), it is clear that our state service is not satisfying that demand. We require more local research into the musculoskeletal disease burden of the South African community in an effort to motivate for expansion of our Orthopaedic services and improve care. This research needs to specifically look at disability utilising DALY calculations to identify the burden of orthopaedic-related pathology.